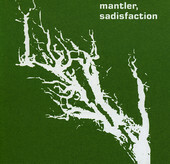 Sedative pop music for the sleepless, restless nights of winter, Mantler (aka Chris Cummings) delivers cool, breezy, electronics-tingled pop music that floats in mid-air, using the space and atmosphere to strengthen its compositions. All while Cummings' voice hovers over the song, oft-times hushed, while other times mellow yet attentive. This is a relaxing, slumbering album that seems dark and brooding at first, but is pleasant and delightful on further listens. I'll give it a B-.